Garlic Butter Recipes Garlic Butter is creamy and spreadable, but it also provides a little flavor boost to all kinds of dishes. With a minimum of time and ingredients, you can learn how to make garlic butter. Want to learn how to make a quick and easy garlic butter that your family and friends will love? Then these short video shows will help you to make a fresh and tasty fresh garlic butter spreads. Great for home made garlic bread, garlic butter shrimp or fish, or anything else you are looking to kick up a notch. Excellent! For a real quick and clever flavoured butter follow the steps in my video and make up a batch for the freezer! I LOVE garlic butter and when you make it yourself you can make it as strong as you like. PS, I like mine strong! How to Make Garlic Butter Sauce : Butter Sauces. There are a large number of different butter sauces that you can easily make right in the comfort of your own kitchen, as long as you have enough time and the right ingredients. Get tips on butter sauces with help from an experienced culinary professional in this free video series. Cooking with Phyllis: Roasted Garlic and Herb Butter. 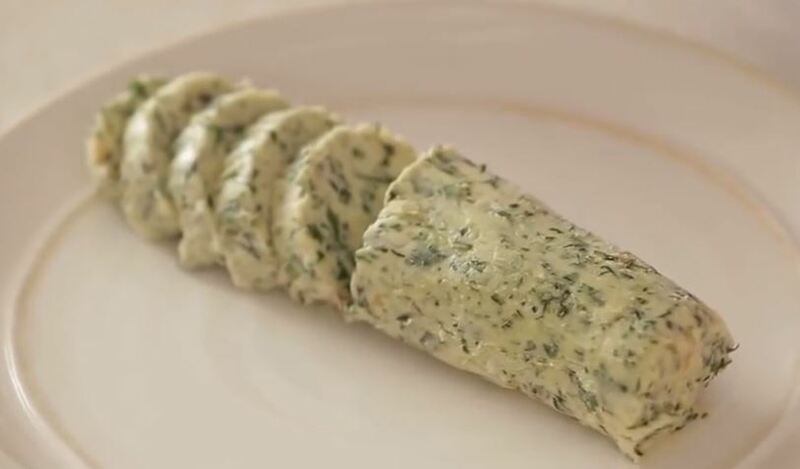 Think that herb butter is too fancy for your weeknight dinner table? Think again. Here’s an easy but delicious recipe, full of caramelized garlic and fresh herbs, that will make any dish—from grilled vegetables to medallions of beef—special. How to Make Compound Butters – Garlic Butter Recipes. Fabulously flavored butter for slathering on your baked potatoes, bread, fish, chicken, steak and vegetables. Chef Ted from the Rada Cutlery Kitchen demonstrates the easy way to make a variety of flavored butters. 1 lb. unsalted butter, room temperature. 2 lemons, zest and juice. Although garlic is neither an herb or a spice it has been used to enhance food as far back as when the pyramids at Giza were built. This unassuming bulb (from the same family as onions and leeks) packs a powerful punch and is an essential element to recipes from around the world. Chefs and home cooks use it to enhance and intensify other ingredients or even as the signature element of a dish. Its taste varies in depth and aroma depending on the way it is cooked – it can be used raw for an intense level of heat that leaves a lasting impression, or baked to a soft velvety texture giving a milder taste. There are many varieties of garlic and they differ in size, pungency and colour. The bulbs found on sale are actually dried in the sun, though we tend to consider them fresh. Smoked garlic is dried garlic that has been smoked to give it a golden hue and mellow smoky flavour. Wild garlic is a seasonal and foraged variety of which, unlike common cultivated garlic, it is the leaves that are eaten rather than the bulbs. The taste is more delicate than other garlic and it’s made a welcome return to restaurant menus in recent years, becoming a fashionable and sought after ingredient. Jenny Linford’s inspired recipes include delicious ideas for dips, snacks, meat, poultry and fish plus pastas and breads. Master much-loved classics such as Aioli, Ajo Blanco (almond gazpacho), Spaghetti al Vongole, Garlic and Anchovy Roast Lamb and Boeuf Bourguignon, then try some new recipes such as Garlic and Pistachio Muffins, Korean Beef Bulgogi, Stir-fried Miso Pork with Wild Garlic and a Taiwanese Braised Pork Bao (steamed buns). Garlic Butter Recipes. Spain Info Garlic Butter Recipes San Francisco De Asis, Urb Marina, San Fulgencio, 03177, Alicante, Spain.